>> Click to download the 2015 Wisconsin Stars of Life program booklet, which includes information on each honoree. Words of congratulations and thank you, smiles, handshakes, hugs, and so much more were abundant at this year's Wisconsin Stars of Life, which recognized twenty-six honorees nominated by their respective ambulance service or an organization. The two-day event was held in Green Bay on September 23 and 24, 2015. The celebration began at Lambeau Field with a Welcome Reception that was kicked off by VP of Marketing Gabrielle Dow, followed by a welcome message by Director of Sports Medicine Pepper Burruss, both of them with the Green Bay Packers. Wisconsin Star of Life introductions came next that included personal stories and accolades by the Stars' respective employer, co-worker or family member, to include presentation of a commemorative Star of Life lapel pin for each. The following day the Paramedic Systems of Wisconsin Conference provided for the formal dinner and awards program, where each Star was formally introduced and inducted as a Wisconsin Star of Life honoree, and presented with a gold medallion and signed certificate of appreciation from Governor Scott Walker. The program concluded with the announcement Fire and EMS Chief Deonne Eske with Ashippun Fire Department was chosen as Wisconsin's representative to attend the 2016 National Stars of Life awards program in Washington, D.C. National Stars of Life is produced by the American Ambulance Association. During the past thirty-two years, Eske has been a volunteer EMT/firefighter, lieutenant, captain, and is currently chief at the department. In 2014, she attended 100% of fire and EMS meetings and over 90% of fire and rescue calls as a volunteer. In addition, Eske presents an annual fire safety program to the elderly, including calling 911 and how to prepare for the ambulance arriving. Her department's nomination also included how she follows up on patients who were recently transported by the ambulance - even cleaning and changing bed sheets before they came back home. Larry Krueger nominated by the Town of Sheboygan First Responders. Wisconsin Stars of Life honorees meeting in the Office of the Governor at the State Capitol with Governor Scott Walker, center, on Tuesday, October 27, 2015. Relating to: congratulating the 2015 Stars of Life honorees. 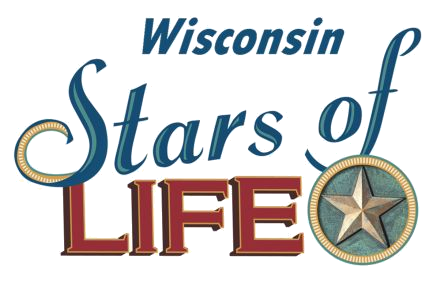 Resolved by the senate, the assembly concurring, That the members of the Wisconsin legislature congratulate the 2015 Stars of Life honorees and commend those receiving this award for their achievements and continuing dedication in serving the residents of their community. What it means to be a "Star"
"The stars of life award program was an awesome experience, from the pinning ceremony at Lambeau field to the awards banquet at the Tundra Lodge. Everyone who received this award was honored for their commitment and dedication to their community and was made to feel very special. I am truly humbled and honored to represent Wisconsin in Washington DC in April. Congratulations to all the stars of life honorees for the recognition of their service and commitment to the field of EMS." Deonne Eske, Fire and EMS Chief, Ashippun Fire Dept., Ashippun, WI, and 2016 Wisconsin Representative to the National Stars of Life, Washington, D.C.
"The Star's of Life 2015 ceremony was truly an awesome experience! I was constantly surprised by how well it was put together and all the fantastic people I met!" "I am truly honored to have been a part of this amazing group." "Thanks for an amazing experience and an incredible honor." 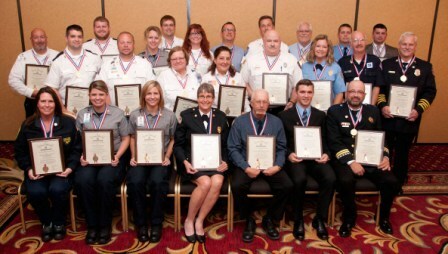 The American Ambulance Association honored 103 Stars of Life from 90 communities in 29 states across the country for their selfless acts as EMS professionals. AAA President Mike Hall welcomed the stars and their guests to Washington, D.C., April 11 to 13, 2016 for a week of celebrations and meetings with key legislators. 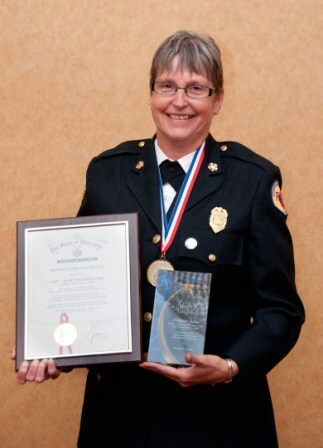 Ashippun Fire and EMS Chief Deonne Eske was chosen by PAAW's National Stars of Life Selection Committee as Wisconsin's representative to attend the 2016 National Stars of Life awards program, and participate in the AAA event. Chief Eske is pictured below with AAA President Mike Hall who presented her award. Eske's trip to Washington, D.C. was financially underwritten by PAAW and the AAA Foundation.